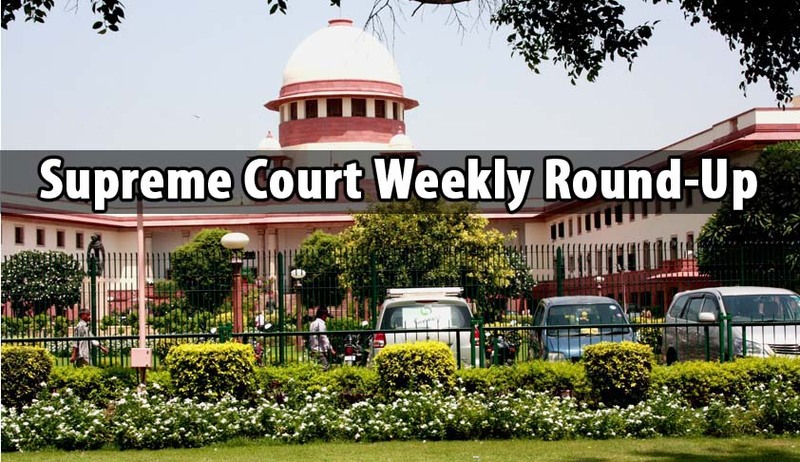 Live Law reported three judgments of Supreme Court of India, last week. Supreme Court on Monday, held that, merely because the accused is charged with a serious offence at a later stage may not by itself be the reason to refuse the grant of anticipatory bail if the circumstances are otherwise justified. The court observed that no purpose would be served in compelling the appellant to go behind bars, as an under trial, by refusing the anticipatory bail in respect of alleged incident which is 17 years old and for which the charge is framed only in the year 2014. The Centre was slammed by the Supreme Court for its “callous and casual” approach towards welfare of urban labourers. The labour secretary was asked by the court to be personally present before it and explain how the government intends to spend over Rs 27,000 crore collected as construction cess. The Supreme Court on Friday said that monitoring the implementation of the Right to Education Act across the country is a difficult task and it’s not possible for it to undertake such an exercise. The Supreme Court today issued notice to Madhya Pradesh government on a plea by whistleblowers seeking transfer of four pending petitions relating to Private Dental and Medical College admission scam from Jabalpur High Court to Supreme Court. A two Judge Bench of the Supreme Court issued notice to Union of India, Bar Council of India and Rajiv Gandhi National University of Law Patiala, on a PIL filed by Professor Shamnad Bahseer seeking to set up a permanent body to conduct the Common Law Admission Test (CLAT). A Supreme Court Bench headed by Justice Ranjan Gogoi came down heavily on its registry for poor maintenance of judicial records of a sensitive case and summoned the Secretary General of the Apex Court. The Supreme Court on Wednesday said the appointment of law officers to represent governments in courts cannot be an act of “political appeasement” and must be transparent. A bench of Justice T.S. Thakur and Justice Kurian Joseph made this observation in the course of the hearing of a plea by the Punjab government challenging an order of the Punjab and Haryana High Court. The Supreme Court sought to know from the Centre about the steps taken to implement the recommendations of the special investigation team to bring back Rs 70,000 crore worth of black money stashed in foreign banks. The Indian Army today submitted before the Supreme Court that has put on hold all promotions of personnel from Lt Colonel to Colonel rank till it decided on the validity of the new command and exit policy which is under challenge before it. Supreme Court Bench comprising Justice Ranjan Gogoi and Justice N.V. Ramana reportedly praised the Union Government on Tuesday for its “commitment” and the “positive steps” taken by the Centre for filling up vacancies meant for differently-abled persons. The Centre told the Supreme Court that it could not approach the International Court of Justice as it had itself stopped Islamabad from doing so earlier.